There are a number of rare diseases that affect the retina. Our doctors are retina experts and can be helpful if you have a rare vision disorder or are having complications either surgical or medical. What is Retinal Pigment Epithelial Dysgenesis? The retina is prone to a myriad of rare and difficult to diagnose diseases. Our doctors are experts in both medical retina and surgical retina diseases. 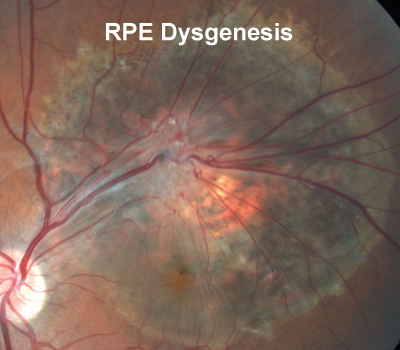 The image on the right is of a patient with Retinal Pigment Epithelial Dysplasia. When Dr. Cohen published this case, the disease had only been described in two other patients. It is usually benign, but this patient was developing central vision loss from progressive vitreoretinal traction. Ultimately, the patient left Florida and was followed at Duke Eye Center. 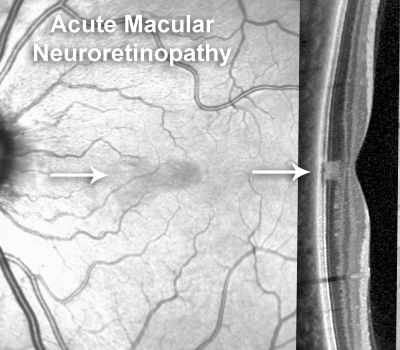 What is Acute Macular Neuroretinopathy? Acute macular neuroretinopathy (AMN) is a rare condition, originally described as dark, wedge-shaped intraretinal lesions pointing to the fovea and sparing the retinal pigment epithelium (RPE) and retinal vessels in young women taking oral contraceptives. The lesions of AMN are generally difficult to visualize with color photography and are visualized better using red-free photography. Optical coherence tomography findings of AMN show focal outer nuclear layer (ONL) thinning and inner segment/outer segment (IS/OS) disruption. The photo to the right is an infra-red image of a woman with AMN and a spectral domain OCT image of the same lesion. This patient had gradually improving vision over about a year. Sickle cell disease leads to a variety of occlusive vascular changes, both nonproliferative and proliferative, in the anterior and posterior segments of the eye, particularly in patients with SC hemoglobinopathy. 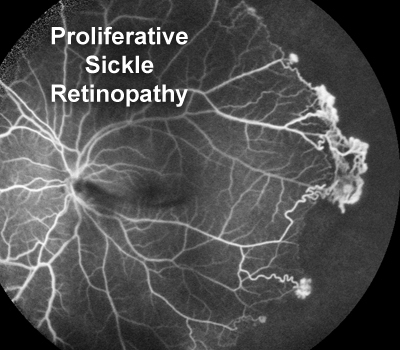 Proliferative sickle cell retinopathy mainly affects the peripheral retinal vasculature, and its manifestations include capillary dropouts, arteriolar-venular anastomoses, and sea fan neovascularization. The accompanying photo is of a patient who thought he had sickle trait but had HgB SC disease. He presented with a vitreous hemorrhage and had peripheral retinopathy typical of Hgb SC disease. He did well with laser therapy. Solar retinopathy is retinal damage that results from exposure to solar radiation. Patients with solar retinopathy usually experience sun exposure through religious ritual participation, solar eclipse viewing without proper precautions, or from mental disturbances via drug intoxication or schizophrenia. Solar retinopathy occurs primarily through a photo-oxidative pathway rather than by direct thermal injury. The decreased VA in solar retinopathy is generally central and usually improves with time, though not completely to normal. Most patient notice a very small blind spot in the central vision that they can see around. The patient whose photos are shown here had nearly normal vision. The most diagnostic test for solar retinopathy is the spectral domain optical coherence tomography line scan shown here. 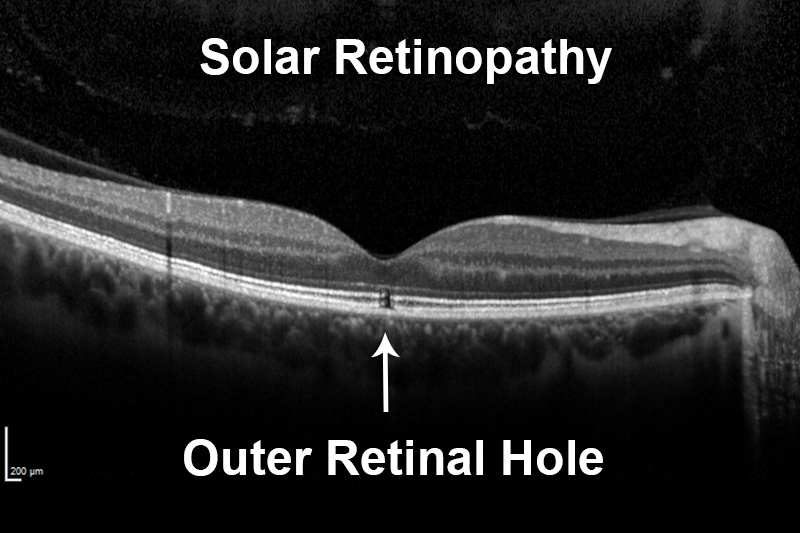 Patient with solar retinopathy have an outer retinal hole. That is a very small defect that only affects the outer retina. This defect can also be seen in patients with macular telangiectasis and tamoxifen retinopathy. A history of sun exposure is helpful in diagnosing this disorder.